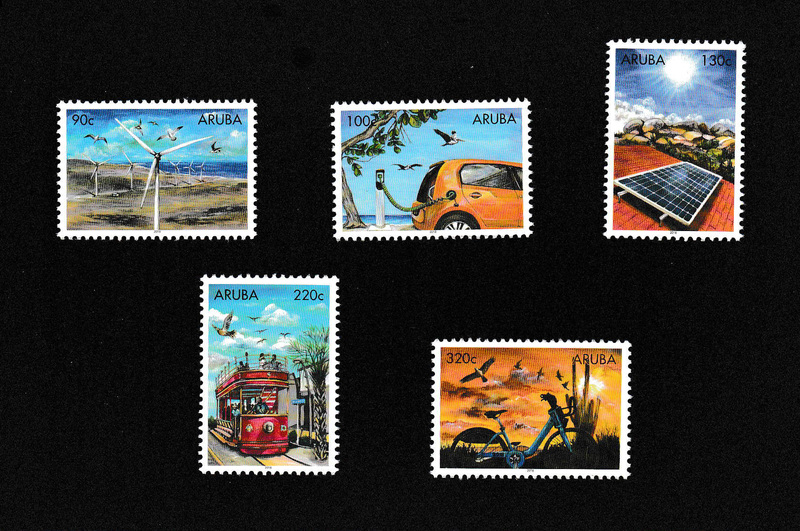 This set of 5 stamps illustrates different ways of Sustainable Energy here on Aruba. Aruba hopes to be a Sustainable Green Island by 2020 – this then will be the first one in the Caribbean. With these mills, electricity is generated to support the Energy Company. Should the fuel turbines fail, the wind turbines are then switched on to generate electricity. The intention is to build more wind farms in the future so that they are no longer dependent on fuel oil alone. Aruba is on track to have the world’s first Sustainable Energy economy and to achieve the goal of running on 100 percent sustainable energy by 2020. 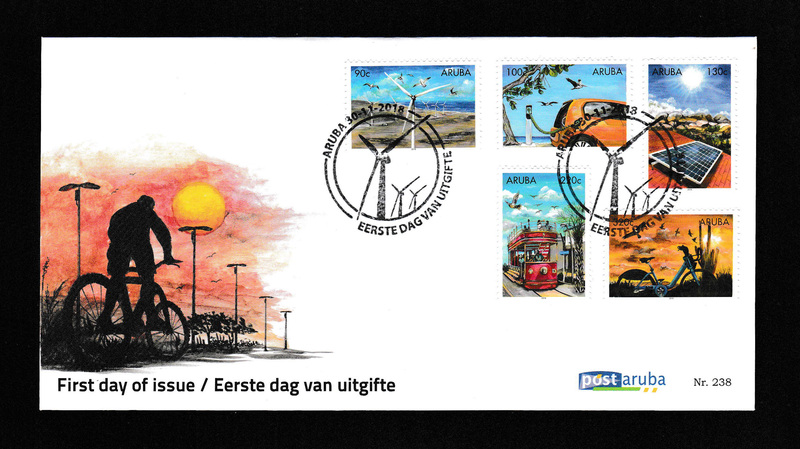 In the year 2009 Aruba built the Vader Piet Windmill Farm, located on the island’s northern coast. This car is moved by electricity. At strategic locations the car can be loaded to continue without using petrol. This reduces the environmental pollution. There is a number of these cars on Aruba. The solar panel transfers energy to a battery that generates electricity for electrical appliances and lamps. The solar energy is used during the day to generate electricity. This electricity is then used in the evening. The Streetcar runs on rails along the known destination locations. It is driven by electricity or uses solar energy to prevent environmental pollution. 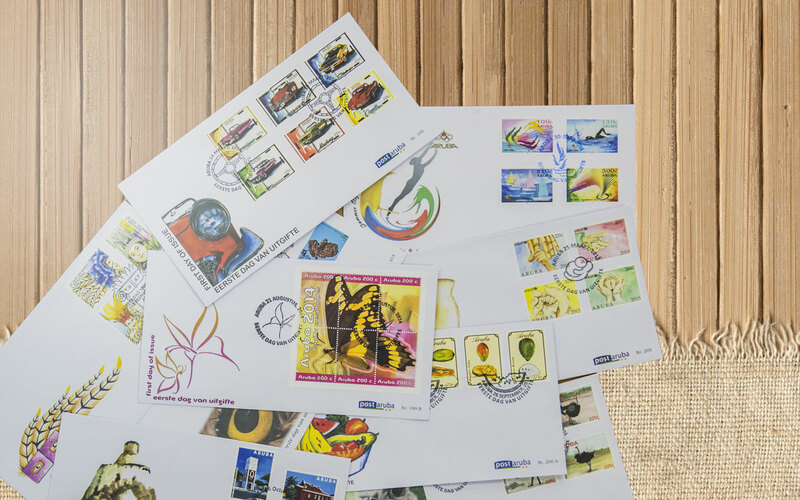 These stamps are available at all the Post Office locations, namely in Oranjestad, San Nicolas and Sta. Cruz. Make sure that you have this set in your collection as the stock is limited.